Sometimes it takes a while for things to come together. And sometimes the outcomes can be a bit unexpected. A couple of years ago, at the suggestion of then-Councilor, now-board member Betsey Buckheit, Glen Castore, Erica Zweifel, and I started meeting to talk about regional economic development; calling it something like the “Northfield Neighbors’ Kaffee Klatsch”. We added Liz Messner from Waterford Township, and Greg Langer from Greenvale Township, and, eventually, Ron Sommers from Northfield Township, and, ultimately, Suzie Nakasian (because she, and Erica, and Glen had worked together on a project in Rice County). Out of that initial effort, we got a project by St. Olaf student Gabriel Trejos on agriculture in the Northfield Area economy, a project by St. Olaf student Will Lutterman on Northfield’s business mix, and Glen’s anaerobic digester project. At about the same time, at the suggestion of Joe Hargis (of Carleton College), a member of the NDDC’s College-Community Collaboration Committee, I met with Mark Gleason (also of Carleton College) to more more community projects with college students. Mark (and later various faculty members at both colleges) pointed me to Carleton Professor of Geology Mary Savina, who I already knew, as someone who was good at “cross-Cannon collaboration” and doing long-term projects in semester-length segments. Mary gave me a copy of recent Carleton grad Ana Vang’s senior comps report on questions that would need to be answered before we could pursue taking out the dam. I’ve used it as a source of projects in the area of “restoring the river to health” which has produced projects by the students of Matt Richey and Diane Angell at St. Olaf, and projects by the students of Kim Smith, Carrie Jennings, Sam Paterson, and Aaron Swoboda at Carleton. “Finally”, Mary finished her sabbatical and other obligations and had her class do a bunch of projects, several of which were related to flooding in the Spring Creek Watershed. Around that same time, Erica, Glen, and I (perhaps thinking of the economy in the context of the environment) attended a CRWP-organized session at which we learned that the DNR has money for flooding studies and flood mitigation projects. As soon as the CRWP session ended, I approached Pat Lynch, of the DNR’s Division of Waters, about funding a project in Northfield’s watersheds. Erica, Glen, and I applied for a grant on behalf of Bridgewater Township to study the flooding in the Spring Creek Watershed and to develop a plan for flood mitigation. While we were waiting to hear from the DNR, I attended Mary’s class’ presentations, including three that related to the Spring Creek Watershed. I reported on the presentations to Glen and Erica…and the next day we were awarded the grant. Glen said “let’s see if Mary and her students will work with us” on the study. 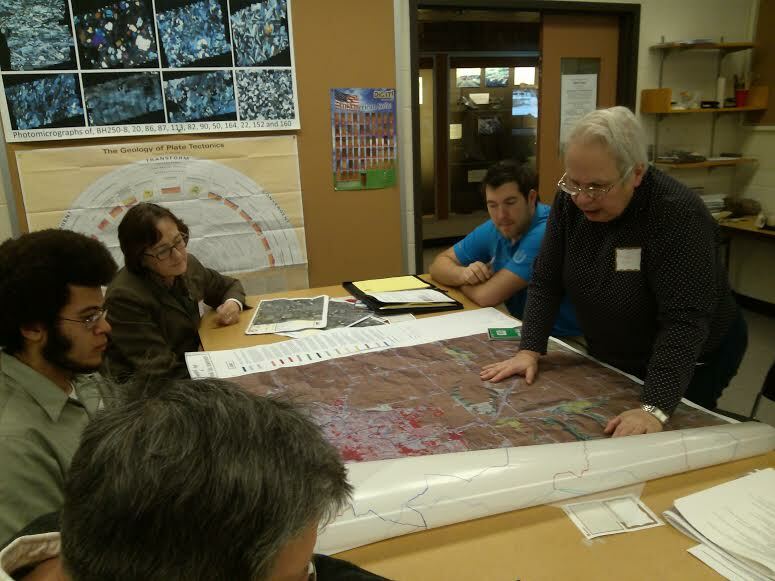 The photo is of the initial project meeting, a Bridgewater Township project meeting that was held on Carleton College’s campus. Pictured are Glen’s head, Jabari Jones (one of Mary’s students), Kathleen Doran-Norton (Bridge Township), Jasper Kruggel (City of Northfield GIS guy), and Mary Savina. Also present were two guys (Ted and Tom) from the consultant (WSB), George Kinney of the Northfield EQC, and Nancy Braker & Jay Stadler from Carleton College. As I said, sometimes some things take a while to come together, and the outcomes are…a bit of lagniappe.